I found an old O2 3G USB broadband Internet dongle sitting around in a box and decided to put it to good use. Here is how I've used it to act as a backup for my main wired broadband Internet connection at home. Properly functioning broadband Internet connection and LAN/WLAN at home. FortiGate firewall running FortiOS 5.0 (I've used v5.0,build0208 GA Patch 3). A mobile broadband Internet dongle (USB) with a valid SIM (I used a ZTE MF100 from O2). Mobile Internet APN, username and password (for T-Mobile APN=everywhere; username=eesecure; password=secure). Note, your USB modem may be provider locked, like mine was to O2. If it is, you will need to unlock it first, by either calling your provider and paying them some of your hard-earned cash, or using this software. Insert your 3G USB dongle with a SIM card into one of the spare USB ports on the FortiGate firewall and reboot it. If you don't reboot the firewall, the USB modem may not get detected properly. Next, you will need to find the serial port used by your modem, because your modem may actually appear on two different serial ports, possibly due to this related bug. In this case the port you want is /dev/ttyusb2, since there is a dial-tone. Unfortunately I am not quite sure how to hang-up the line correctly after this test, so I end up power cycling the firewall at this point. Note, see this Fortinet KB article regarding how to map ttyusbX to wireless-port, which is "3" in this case. While your monitor an external IP with a ping session from a host on your local network, drop your primary external interface and observe the modem interface take over. Note, if you have a tunnelled IPv6 configuration on your primary interface, be prepared for network instability once you fail-over to the modem interface. Since there is no way to specify the modem interface on your sit-tunnel, the tunnel is effectively broken for the duration of the fail-over. Even though I am a couple of years too late for World IPv6 Launch, I've finally decided to implement IPv6 at home. The following step by step guide, should help anyone with access to similar hardware in implementing this solution. Properly functioning IPv4 broadband Internet connection and LAN/WLAN at home. FortiGate firewall running FortiOS 5.0 (I've used v5.0,build0208 GA Patch 3) with IPv6 and Advanced Routing features enabled. 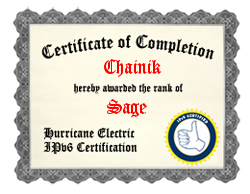 A free account with Hurricane Electric IPv6 Tunnel Broker and DNS services. An Internet domain registered with an IPv6 capable domain name registrar (e.g. Gandi). The following steps should hopefully guide you in setting up a tunneled, but fully functional IPv4/IPv6 configuration, which will further enable you to switch off IPv4 entirely and use NAT64 to continue accessing IPv4 resources from your IPv6-only network. The first step is to establish a tunnel to your IPv6 provider, which in this case will be tunnelbroker.net. set ip6 "client IPv6 address/mask from HE portal (e.g. 2001:470:1234:567::2/64)"
If you have a dynamic IPv4 IP assigned to you by your Internet service provider, you would probably want a DNS name automatically updated, when it changes. Using the HE portal, on your Tunnel Details page, click "Edit" next to "rDNS delegation" and click the link titled "Delegate to dns.he.net". Next, head to dns.he.net and add a new domain, which you have registered with an IPv6 compliant registrar (check with the registra if they support "IPv6 glue records"). Edit the newly added domain zone, create a new A host record (e.g. myip.mydomain.com), making sure to tick "Enable entry for dynamic dns" and set the TTL to 5 minutes. Click the DDNS icon next to you new record and generate a new API key. Got to the "Advanced" tab of the tunnelbroker.net tunnel management portal and register your hostname and API key. Last, go to your domain name registrar's admin portal and delegate your entire domain or a sub-domain to HE.net's name servers (there are five). The problem with this approach however, is that your IPv6 tunnel provider doesn't know about those changes and cannot update your tunnel's public IPv4 address. So, every time you reboot your DSL/cable modem and get a new IP, your IPv6 tunnel will be down. genericDDNS    Generic DDNS based on RFC2136. Note, HE.net is not on the list and since there is no generic dyndns2 protocol option, there is no way to tell your FortiGate firewall to automatically update your tunnel end-point IP. So a workaround I've put in place, is to configure ddclient according to these instructions, to run on a local Linux server, periodically detect my public IP and update the tunnel end-point if it changes. This process updates your tunnel end-point IPv4 and since you've configured a hostname and API key on the tunnelbroker.net portal previously, it will also perform a chained update to your HE.net DDNS host entry. Ideally, you would want your firewall/router to do this as part of it's PPPoE interface-up routines, but we are where we are..
EDIT: I've written a very basic script to obtain the current public IP from the FortiGate firewall directly, rather than going out to a remote site. set ip6-address "first IPv6/mask in the routed/64 prefix from HE portal (e.g. 2001:470:890a:bcd::1/64)"
edit "routed/64 IPv6 prefix from HE portal e.g. 2001:470:890a:bcd::/64"
ip6-send-adv enables router advertisement messages. autonomous-flag enables stateless IPv6 configuration (dynamically generated IPv6 addresses within the prefix). ip6-manage-flag means that there is a DHCP6 server on the network handing out IPs (stateful). ip6-other-flag means the DHCP6 server is also handing out DNS information, etc. onlink-flag basically means the prefix is on a local (layer 2) network. Note, since we are using a stateful configuration where DHCP6 hands out IPv6 addresses, we disable the autonomous-flag to stop a second stateless IPv6 address being assigned. We will be using DHCP6 to hand out IPv6 IPs as well as DNS server information. Note, you will also see a link-local IPv6 address, which is randomly generated. NAT64 is used in pure IPv6 networks to allow access to IPv4 resources. In practical terms, it means you can switch off IPv4 on your internal network and continue accessing IPv4 sites on the Internet via your IPv6 tunnel. For compatibility reasons however, you would probably want to operate a mixed IPv4/IPv6 environment, until at least your Internet provider is able to support IPv6 natively. I found, that when the internal FortiGate DNS server is forwarding to the default FortiGuard DNS resolvers upstream, it completely breaks NAT64. Note, we are disabing the automatic synthesis of IPv6 addresses, since we dont want a synthetic address generated if a host already has an IPv6 address. In this case, an address will by synthethised only if the host does not have an IPv6 AAAA record. This is expected, since we have turned off IPv4, but told cURL to specifically use it to access the web site. Note that there are no IPv6 host records (AAAA) returned for www.fortinet.com. Note an IPv6 address is synthesised from the NAT64 Well-Known Prefix (64:ff9b::/96). Note, at the point you should probably re-enable IPv4 and re-run the test. The only difference will be, that it won't warn you anymore about limited IPv4 connectivity and the use of NAT64/DNS64. I hope you found this guide useful and if you find any mistakes or have any suggestions please feel free to comment.